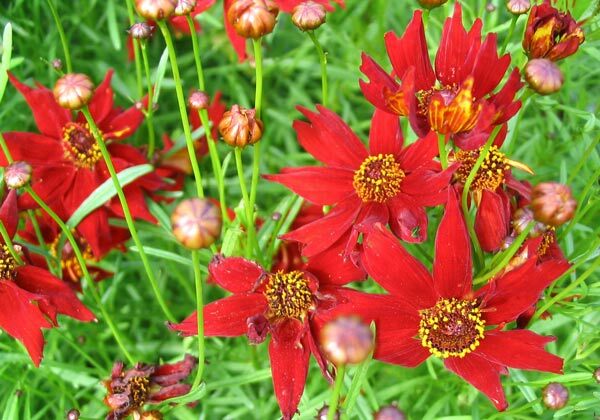 Mahogany Coreopsis is the success story of the Moosey Nursery's Flowering Annuals 2004 - 2005 Programme. What a lovely plant this is! The form is compact, the leaf texture is quite fern-like and delicate, and the flowers are really a beautiful shade of mahogany red. Inspired, too, is the placement next to a gracefully aging light coloured hosta. 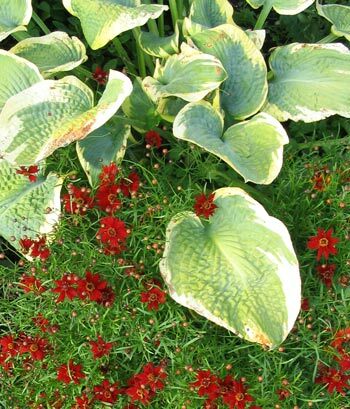 The foliage of the hosta sets off the colour of the little daisy-like flowers perfectly. The timing of flowering is really nice too. This Coreopsis starts to flower in the middle of summer, when the nearby phloxes are starting to crumple. Perfect! I have grown other yellow forms of Coreopsis in my garden, but not with much success. They never ever last over the Moosey winters, though they claim to be perennial. I'm definitely going to keep this red variety going, though - in autumn I'll try collecting my own seeds. Hurray for Moosey Nursery's Flowering Annuals!